The World Bank report is seen as a key indicator for reforming the business environment. In November 2015, the World Bank released its annual Doing Business ranking, in which Russia managed to rise to 51st place. For the Russian economy, this ranking has a particular significance because the government has selected it as a universal indicator for reforming the business environment. When the Russian authorities set a goal of increasing foreign investment into the country, they realized that it was important to show investors that there was a significant change in the business environment. The Doing Business ranking was selected as benchmark. In 2011, Russia was 120th on the list. Unlike other similar instruments, the World Bank rating is far removed from politics. It analyzes specific indicators, such as how many days it takes to obtain a construction permit or how many papers need to be submitted to connect a new shop to the power grid. The methodology used to calculate points is extremely transparent and makes it possible to assess the amount of red tape in the business environment of a particular country on the strength of specific examples. 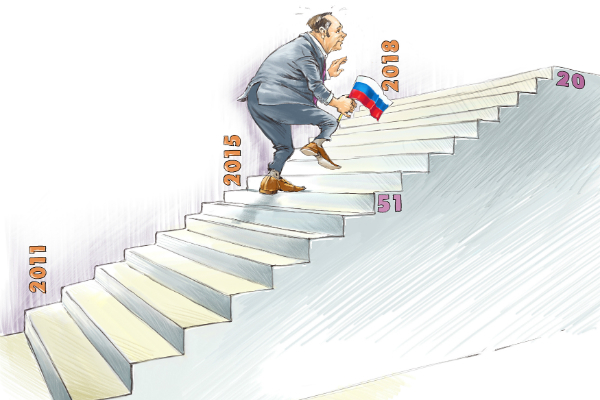 This is why in May 2012, Vladimir Putin signed a special decree aiming to improve Russia’s ranking by 100 points, so-called “100 steps.” Under that decree, Russia should rise from the 120th position in 2011 to the 20th place in 2018, with the interim target being 50 in 2015. The interim target set by the president has been practically achieved. To improve its standing in the Doing Business ranking, Russia undertook a broad range of activities. A new development institution, the Agency of Strategic Initiatives (whose head was selected in an open competitive process from more than 1,000 candidates), has become fully operational. The agency has begun to carry out so-called spot checks. Representatives of foreign investors visit different regions, to check how convenient it is to work with the local authorities there. Another key new development has been the National Entrepreneurial Initiative, a program for developing roadmaps for reforming specific sectors. As a part of this initiative, areas for reform were identified by business representatives themselves, who later assessed how effective the reform was and evaluated the work of state institutions. In line with proposals from entrepreneurs, laws and regulations in Russia were adjusted, government resolutions and presidential decrees issued. Thanks in part to this initiative, it has become possible to simplify the procedure of getting connected to a power grid and to reduce the associated costs to less than a quarter of what they used to be, from 9,500 rubles ($147) to 2,100 rubles ($32.5) per 1 kW. As a result, in the Getting Electricity indicator, Russia rose from the 143rd to the 29th place, an absolute record in the history of the World Bank ranking. Skeptics point out that Russia has managed to improve its Doing Business ranking mainly due to methodological changes. In 2014, the World Bank introduced several changes to how it calculated the ranking. Firstly, for 11 countries with a population of over 100 million, data began to include figures for the countries’ second biggest city as well. Thus, in addition to Moscow, World Bank analysts began to use data for St. Petersburg, where the quality of the business environment has been traditionally higher than in the capital. Secondly, scope was expanded for three indicators: Resolving Insolvency, Protecting Minority Investors, and Getting Credit. As a result of these and other changes, Russia rose from the 92nd to 64th place in one go, and through improvements in some indicators managed to secure the 62nd rank a year ago. Despite a certain amount of skepticism, Russia’s improved ranking cannot be attributed to a change in methodology alone. In the Enforcing Contracts ranking, Russia is in the 5th place, and in 8th place for Registering Property. In fact, is it just one position away from the interim target set in President Putin’s decree. The Economic Development Ministry describes Russia’s improved ranking as a rare example of applying a project-management approach to addressing a task. Furthermore, no one could suspect the ranking compilers of any bias. The Doing Business ranking also reveals the weakest areas in the Russian business environment: mainly, construction and export-import operations. In the Dealing with Construction Permits topic, Russia is in the 119th position (compared with the 156th a year ago). Whereas in the Trading Across Borders topic, in 2015 it even slipped from the 155th to the 170th place, the worst result ever. Experts attribute this poor result to the need for a far-reaching and comprehensive reform of the country’s customs authority. Russia’s positions also suffered because the scope of this indicator has been expanded to include transportation of goods not only by sea, but also by air and rail. Which means that Russia has problems in processing goods passing through all types of checkpoints. For instance, the Doing Business ranking takes into account how electronic systems are used, how long a cargo is kept at the border, how much the paperwork costs. In all these parameters, so far Russia has no progress to report. By way of comparison, in OECD countries, documentary compliance takes a maximum five hours and costs $36, whereas in Russia the figures are 43 hours and $500. According to World Bank calculations, border compliance costs Russian exporters $1,125, while in Kazakhstan, a fellow member of the Customs Union, the figure is $574. To become one the top 20 countries with the best conditions for business by 2018, the Russian government still has a lot of work to do. However, a solid foundation for large-scale reforms has already been laid. In 2015, Russia became one of the world’s top five countries in terms of the number of reforms. They were conducted in five out of the 10 areas being assessed by the World Bank. Alexei Lossan is the RBTH Central Desk editor for busines.